For the CIAO 4.4 / CalDB 4.4.10 release notes see How CalDB 4.4.10 Affects Your Analysis. 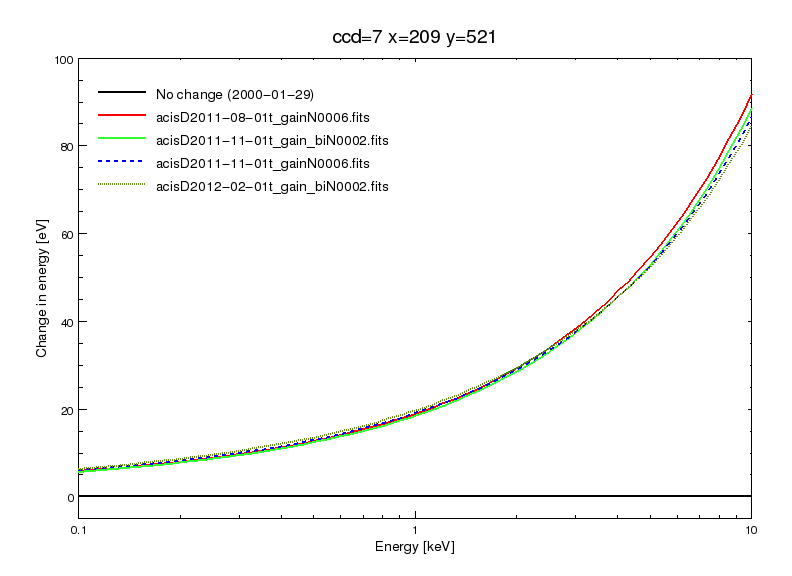 The periodic ACIS T_GAIN correction upgrade for Feb - Apr 2012 has been released. The corrections are at nominal/expected levels of less than 2% of the energy value. This upgrade as usual affects observation data taken over Epoch 49 and 48, and so would update PHAs for OBS_IDs taken since 01 November 2011. Users with such datasets are encouraged to revalidate their analysis results after reprocessing their data with the upgraded CalDB files. For specific details of the new calibrations in this release, see the technical details section below. Also: CIAO reprocessing script chandra_repro for ACIS data with DATE-OBS after (UTC) 2011-11-01T00:00:00. The ACIS Calibration Team has been aware of recent (since 2009) changes in the rate of deposition of the ACIS optical blocking filter (OBF) contaminant, including changes to the spatial distribution of the contaminant. To this end an updated ACIS CONTAM model file has been released in CalDB 4.4.10. The model includes about a 15% change in the optical depth at 700 eV for observations in 2012 as compared with those in early 2009. For more information regarding its affects on specific analysis, see the updated ACIS QE Contamination why page. For a technical presentation of the new contamination model, see the technical details section below. The ACIS time-dependent gain corrections (T_GAIN) have recently been updated for current changes from the previous T_GAIN epoch, specifically Epoch 49, which was Febrary through April 2012. 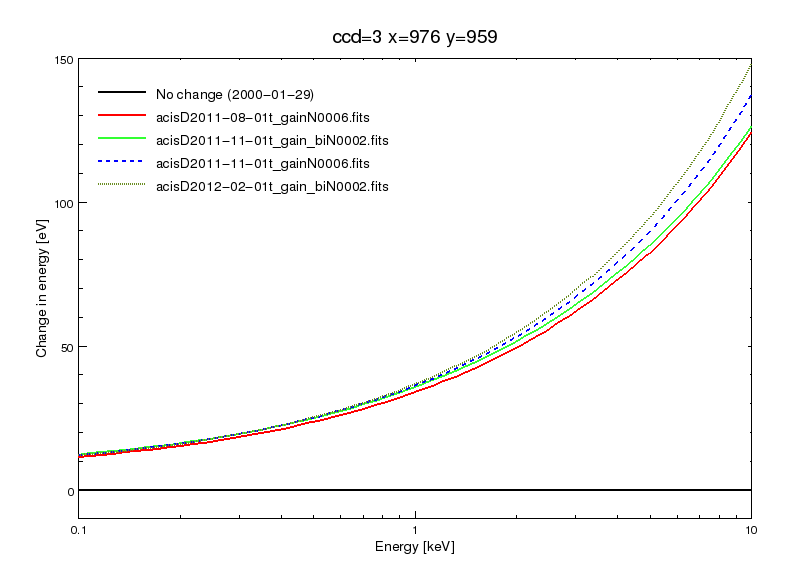 With the addition of these new corrections, derived from ACIS External Cal Source (ECS) data taken during radiation zone passes, the CalDB files extending from Nov 01 2011 through January 2012 (i.e. Epoch 48) have been finalized, and new non-interpolating T_GAIN files are now implemented for Epoch 49. As the Chandra mission proceeds, the contamination on the ACIS Optical Blocking Filters for ACIS-I and ACIS-S continues to evolve, with a marked increase in the rate of accumulation during the year 2009. Now that enough time has passed since this change, a quantitative correction may be made to the ACIS contamination modeling file (CONTAM) in CalDB. In particular there are updates to the time-dependence of the contaminant at the center region of ACIS-I and ACIS-S (Fig. 4), as well as significant changes to the time-dependence of the spatial component, since 2009 (Fig. 5). The spatial pattern for ACIS-I has been updated from an azimuthally-symmetric pattern to a hyperbolic fit. For ACIS-S, the polynomial fit has been replaced by an exponential one. Fig. 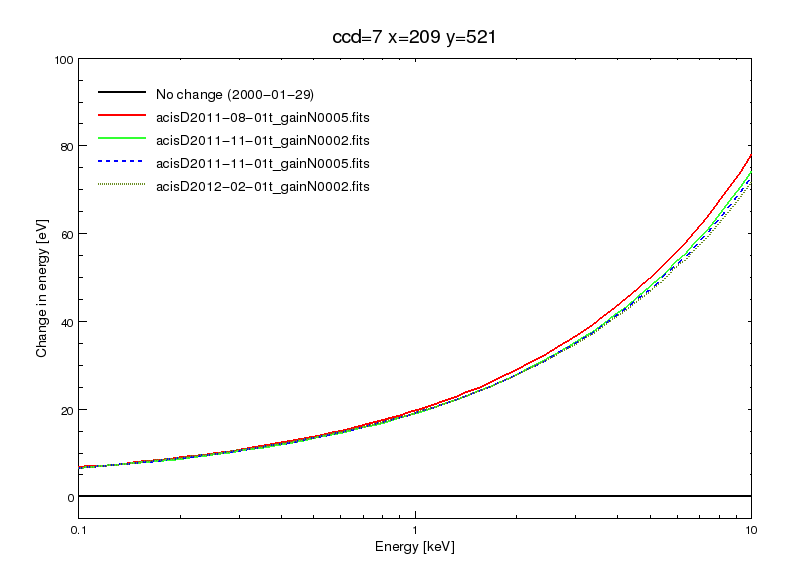 4: Updated time-dependence in the center of both ACIS-I and S to include the latest A1795 measurements. 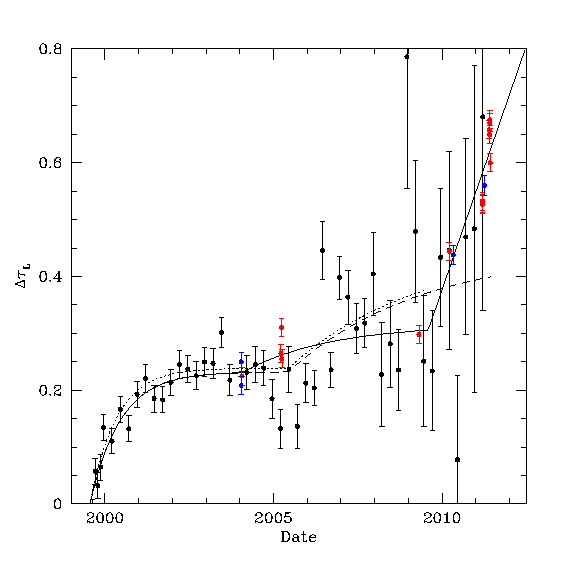 Black points are the ECS L/K measurements, the blue points are ACIS-S and the red ones are ACIS-I. The solid line is the fit in the new latest N0007 model, the dotted and dashed lines are the time dependencies in the CONTAM N0006 model for ACIS-S and -I, respectively. Fig. 5: Updated time-dependence of the contaminant spatial pattern. The same keys apply as in Fig. 4 above. 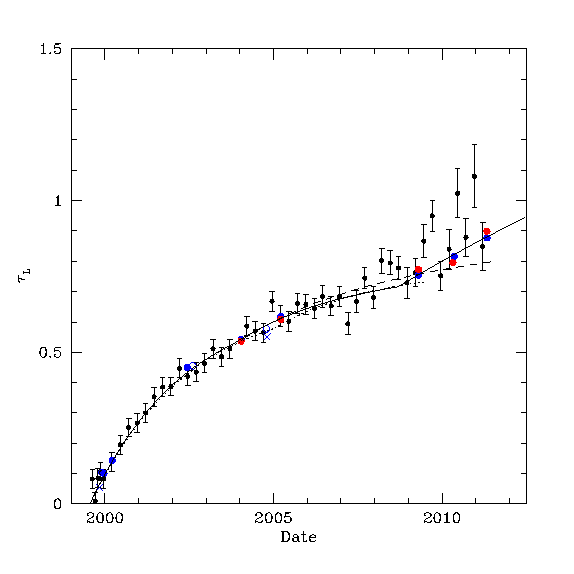 Abell 1795 measurements show that the time evolution of the spatial pattern in I and S is consistent, and that there is a very quick rise since 2009.